The Astra IIIB has somewhat revolutionized celestial navigation. Never before has such a high quality, accurate metal sextant been available at such a low price. Over 22,000 sextants of this model have been sold in the US alone in the past 25 years; far more than any other serious sextant. Its popularity has spread throughout the rest of the world as well, making it the the most recognized (and supported) sextant worldwide. Optional accessories include a 7x35 prism telescope, a slip-on rubber eyecup for use while wearing glasses, and a zero-magnification sight tube. A practice bubble horizon is available which facilitates effective back-yard practice without the need for a sea horizon. 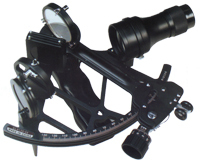 Although the sextant comes with a choice of either whole horizon or traditional split horizon mirror, an extra mirror of either kind is available at nominal cost, and comes already mounted in its frame. Changing mirrors is done quickly by means of two easily manipulated screws.